French are the oldest and original nation in Europe, that has the rich historical and cultural heritage. 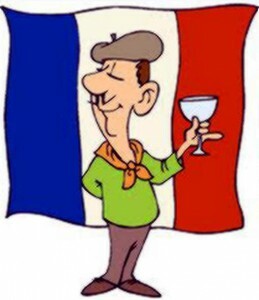 French etiquette represents in itself directly the culture of France. Frenchmen during many centuries are the legislators of high fashion. It is also considered that it is nation that in everything values beauty : in an art, to the clothing, architecture, and others like that. Frenchmen are the relaxed enough nation that is famous the lightness and refinement of manners. According to French etiquette normal are displays of individualism and sometimes scornful attitude toward a public idea. But such is admitted only to those cases, when a frenchman on all one hundred percents reposes in the rightness in a certain situation. In relation to the natives of France is nation very noisy and emotional, for them is a norm to express the emotions in a language, gesticulation and mimicry. They very like to discuss someone, pass remark, but here very negatively behave to criticism in the address. In a business sphere frenchmen behave impeccably. And idea about them as about safe, irresponsible and unorganized people is erroneous. Etiquette in France is one of main constituents of national prestige. Therefore frenchmen in an expensive situation try to behave at high level, demonstrating the politeness and gallantry. Also large attention is spared by the frenchmen of etiquette of communication. They adore erudite and witty people, here can surprise passion for intricate expressions and beautiful acts. In attitudes toward women, the French men are capable on unexpected and unbelievable actions for the sake of them. They are gallant, attentive, ready to execute the expensive desire of sweet one immediately. But such of them only until living love. After fading of feelings, two peacefully and go away civilized. In this country, in spite of everything, absolutely normally behave to the break of marriage relations. In France, if there are simply acquainted, then at greeting each other it is accepted to interchange only handshakes. If there are relatives or close friend then they welcome each other cuddles and kisses in both cheeks (this greeting is named faire la bise). But lately, by frenchmen in etiquette of greeting between near people, the certain elements of liberty were brought in – only one kiss in a cheek, or simply denotation of him, that is the sign of flirting and display of the personal interest. In relation to the rules of greeting in the south areas of France, there between relatives assumed and three and even four kisses, but lately (especially between men) this custom was replaced only by simple handshakes. However greeting between acquaintances with cuddles is accepted only at the first meeting on a day, in future it is accepted to welcome only the flap of hand, underlining the favour and accompanying traditional expression “salut” (salut). At meeting of unknown people and in official cases, during greeting it is accepted to expound respect, adding to the polite form traditional “messieurs” (monsieur), “mesdames” (madame) or “mademoiselle” (mademoiselle) even without pointing of the last name. Being in public places and with the aim of maintenance of the generally accepted polite attitude toward wider public, to smile it is considered to the unknown people beside the purpose. Citizens of other countries, that visited France mark that frenchmen, intermingling with unfamiliar people, during conversation try to such interlocutor not to look into eyes and it is talked by even monotonous voice. In the same time, when at a shop or cafe a visitor calls and opening doors welcomes his owner, that in turn usually in tone of guest also welcomes him, even if first sees this client. It is necessary to mark that frenchmen very like when visitors of public places of such as a cafe, restaurant or hotel at an entrance push a door to after itself. Thus one consider it the sign of embodiment of closed of private life, other – by a rescue from street noise, by good taste, and others like that. Thus, to see in the housing dwelling the unclosed doors to the bedroom or bathroom practically not maybe, similarly as the exposed doors in the subsidiary rooms of any public establishments. In France it is not accepted to be broken in shut the door to, if doors have absent a ring or special ring, it is necessary in the obligatory order to knock before an entrance, warning the same of the presence and to wait till permission, to enter. This tradition all habitants of country stick to, as directly frenchmen so foreigners that live there, as in private life so in business relationships. Only in establishments of trade, on the doors of that there is a table it is “open” it is possible to call without to the knock. It is necessary to mark that in France responsibly enough behave to business style in a clothing and etiquette of communication. So as all of it must be impeccably – and on a form and on maintenance. To talk about a fashion and about that, how frenchmen get dressed, it is possible very long. But will touch themes of fashion directly within the framework of etiquette. If in everyday life in the cities of France in a clothing give advantage to the brave innovations and any liberties, then to business style severe enough rules, corresponding fashion of clothing, color, length, invoice of fabric, are produced in a clothing. Thus such strictness does not abolish a right to use stylish accessories that complement original appearance. On the whole to the expensive clothing the inflexible is pulled out for frenchmen governed, namely: a dress must be stylish and elegant. And practically always to him it is possible to bring in a vulnerable “accent”, for example, bright scarf, refined hat, glasses, beads, and others like that. Being in France, in case if you were invited on the informal meeting, it is necessary to pick up a clothing in style a la décontracté. But it does not mean that it is possible to dress a t-shirt men, but to the women cocktail dress. Frenchmen assume less official hereunder, but however elegant and restrained dress. It is necessary to mark that for veritable frenchmen there are no good reasons, to look slipshod. Thirst, tiredness, bad mood, haste – all exactly a clothing must be all right. This entry was posted in Aesthetical, Ethical on 26/04/2016 by Mary.